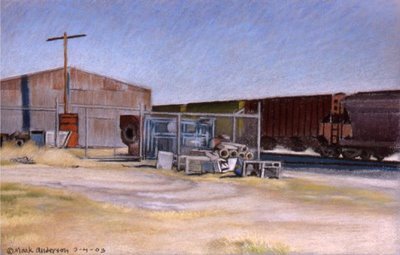 Please come to Vancouver Washington for the opening of my show "Deserted Landscapes", on Thursday March 3rd, from 5 - 8 pm. 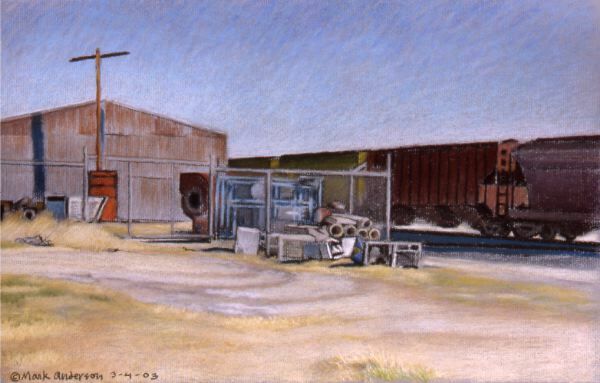 Most of the show will be chalk pastel landscapes done in western Texas and southern New Mexico, such as "Freight Cars", shown above. Also I'll have some very detailed color pencil flower drawings. The show will run from March 3rd through April 2nd. The show will be at Aurora Gallery, which is at 1004 Main Street in downtown Vancouver. The gallery number is 360 696 0449. You can also visit other Vancouver galleries the same night, as part of ArtWalk. Every first Thursday evening of the month galleries hold public receptions and unveil their new shows. A map and listing of the Vancouver galleries will appear in the Tuesday March 1st edition of the Columbian.